But average price isn't the only metric. The Vancouver housing market is now falling by various metrics — and the drop is most pronounced among the priciest properties. 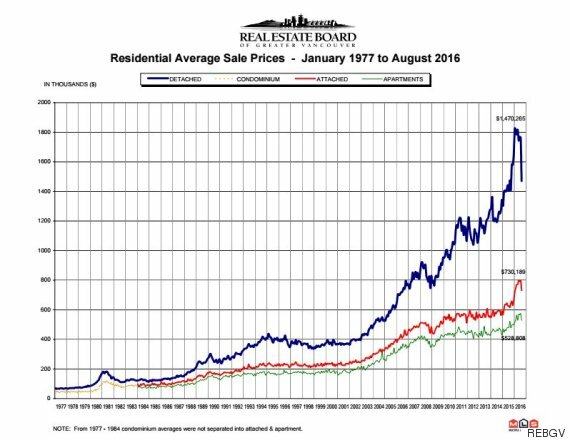 The average price of a detached Greater Vancouver home fell by 16.7 per cent last month, representing the biggest single-month drop it has seen in 39 years, according to a graph provided by the Real Estate Board of Greater Vancouver (REBGV). 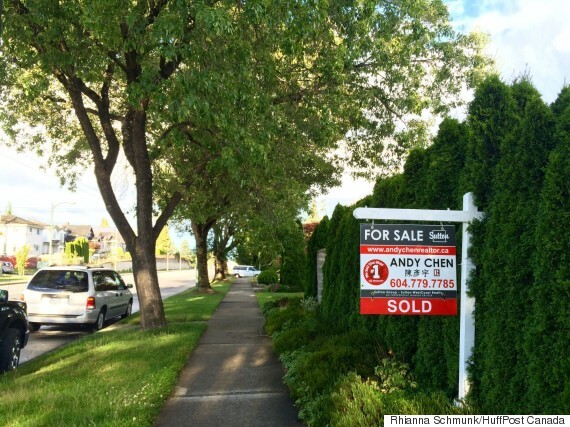 An average-priced detached home throughout Greater Vancouver now costs $1,470,265, compared to $1,764,682 in July. Detached homes are represented by the blue line, attached homes by the red line, apartments by the green line. The average prices of attached homes and apartments also fell, but not as dramatically as detached properties. An average attached home fell by 8.6 per cent to $730,189, while apartments dropped by 7.8 per cent to $528,808. 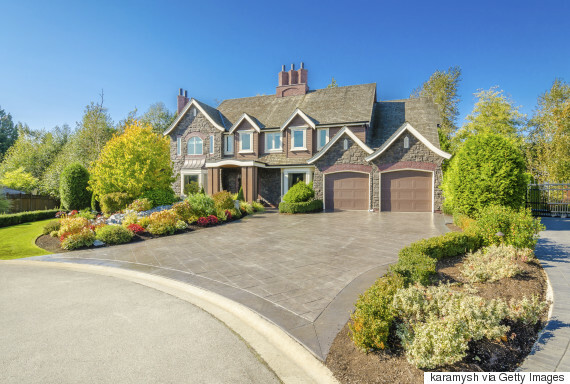 Those prices are a reflection of the fact that higher-end homes just aren't selling — they don't necessarily show that the market is dropping as a whole, SFU professor Andrey Pavlov told The Huffington Post Canada. But they also hint at the influence that foreign buyers were having on higher-priced properties, especially after B.C. 's government instituted a 15-per-cent Property Transfer Tax on purchasers from other countries, he said. "I don't know why people are obsessed with average, to me that's basically saying, oh well now fewer high-end properties are selling," Pavlov said. The fall in average prices may not indicate a crash, he added. But sales volumes do. 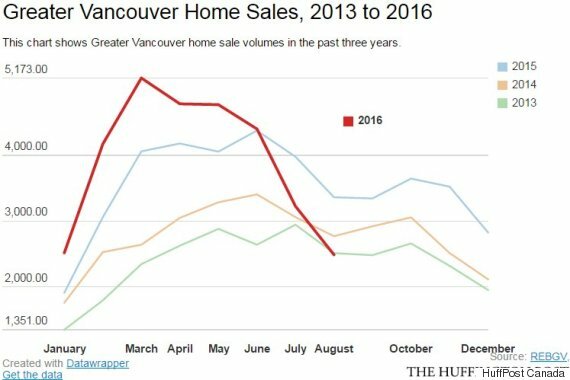 Vancouver home sales usually drop in August, but they're lower this year than they were in the past three. Greater Vancouver recorded 2,489 home sales last month, about as many as there were in August 2013. "The drop in sales is very substantial," Pavlov said. "In pretty much any markets, it's never the case that you have price decline and huge volume. It's always volume disappears, and then prices drop. For his part, Pavlov prefers to measure a housing market in terms of its median price. And by that measure, you find a mixed bag when it comes to Vancouver real estate. The median price of a detached home in Vancouver West went up very slightly last month, from $3,519,000 to $3,550,000. It went down in Vancouver East, from $1,620,000 to $1,472,500. Median increased in both areas on an annual basis. 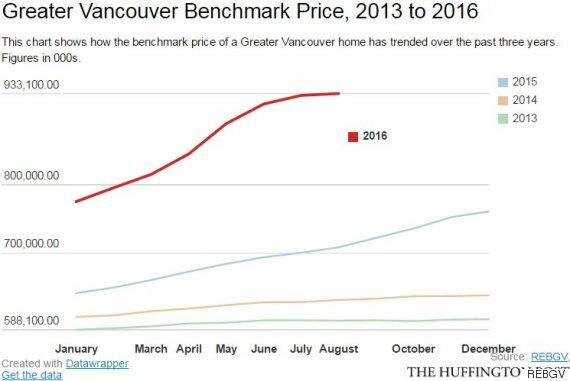 The REBGV calls average price the "simplest home price measure to explain" but says it's "not the most accurate since it may be skewed by the mix of properties." Instead, the board relies on benchmark prices, which account for factors such as a home's age, lot size and how many rooms it has. It allows people to see how much a "typical home" costs in a different area, the board says. The metric supports a rosier view of the Vancouver housing market in August — though it also shows prices levelling off. The benchmark price of a home in Greater Vancouver was $933,100 in August, up only 0.3 per cent from the month before, and up 31.4 per cent from a year prior. The benchmark price of a detached home alone was $1,577,300, down 0.1 per cent from July, but still up 35.8 per cent year over year. Real estate board president Dan Morrison said August sales represented a return to more typical levels, adding that the new provincial levy likely played a role. "The new foreign buyer tax appears to have added to this trend by reducing foreign buyer activity and causing some uncertainty amongst local home buyers and sellers," he said in a news release. "It'll take some months before we can really understand the impact of the new tax. We'll be interested to see the government's next round of foreign buyer data."